Each state has different legislature concerning the warning lights that emergency vehicles use. It's important to be familiar with what the different warning colors mean, as well as the vehicles which use each type of emergency vehicle light. Montana's state law defines the circumstances under which emergency vehicles must use their warning lights. According to Montana statute 61-9-402(1), every police vehicle is required to have a siren. This siren must be able to emit an audible warning signal. The lights attached to the siren should flash or rotate blue and red coloring. If a police vehicle is working with another authorized emergency vehicle, the vehicle might be equipped with a set of rotating or flashing amber lights. These lights may be installed in addition to the blue and red lights, but they cannot replace the blue and red lights. The police lights must be placed as high on the vehicle as possible, usually mounted on the roof. They must also have the widest possible lateral space. Each light must flash alternate colors on the same physical level. All equipped lights have to be visible within 500 feet of the vehicle, from both the front and the rear. If an emergency light doesn't have 360 degree visibility, the vehicle is in violation of this statute. If a police vehicle is being used as a control vehicle rather than an emergency intervention vehicle, the officer may place a green light on the vehicle's roof. This usually happens when police cars are used to create a sense of command and calm during a disaster. Green emergency lights must also be visible within 500 feet. If the vehicle is not in command and control of a scene, the driver is not permitted to use a green warning light. According to the definitions outlined in state statute 61-1-101, firetrucks meet the legal definition of an authorized emergency vehicle. These vehicles are made to respond to fire-related emergencies, along with emergencies involving potentially toxic substances and gases. All authorized emergency vehicles are required to have an audible siren, along with a rotating or flashing red light. The vehicle is also required to have multiple signal lamps equipped. These should be mounted on the top of the vehicle, or otherwise as high as possible. They should also have the widest possible lateral spacing. Each of these signal lamps must be installed on the same level. At the front of the firetruck, two rotating or flashing red firetruck lights must be visible within 500 feet. The same requirements must be fulfilled with another pair of red lights at the vehicle's rear. According to state statute 61-9-402(4), authorized emergency vehicles are also required to have rotating or flashing amber lights. These lights must meet all visibility circumstances outlined for a firetruck's red lights. Finally, if a firetruck is being used as the control vehicle in a disaster, it must have a green light placed on top. This green light can only be used when the vehicle is functioning as a main control point. 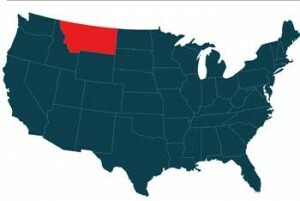 If this isn't the case, normal emergency lights should be used; green lights are a violation of Montana law. This circumstance is outlined in state statute 61-9-204(8). The subject of volunteer firefighters is addressed in state statute 61-9-227. The statute stipulates that certain private vehicles will use a revolving or blinking red light as a form of personal identification. Private vehicles belonging to volunteer firefighters fall under this jurisdiction. To use a warning signal, a volunteer firefighter must have received authorization from their fire department's chief. It can only be used when the vehicle's driver is en route to a time-sensitive emergency. The light's use only applies to the initial emergency response. After the vehicle leaves the scene of the emergency, the driver must turn off the warning lights. The light must be located either on top or at the front of the vehicle. The warning light should be visible by traffic surrounding at both the vehicle's front and rear. If a volunteer firefighter uses an emergency light on their privately-owned vehicle, they must also have a personal identification card. This officially-issued card shows the vehicle owner's name and indicates which organization they belong to. For the card to be valid, it must have the signature of the fire chief or other individual who authorizes the emergency light usage. According to state law, an ambulance meets the definition of an authorized emergency vehicle. Therefore, its emergency light laws mirror the laws governing firetrucks. An audible siren must be accompanied by a rotating or flashing red light. Multiple signal lamps should be mounted either on the top or highest possible point of the ambulance. These lamps must reflect both amber and red coloring. If an ambulance is being used as the control vehicle during a disaster, it must display a green warning light to indicate that it is a control vehicle. Whenever the ambulance is not the main control vehicle, though, the usual amber and red emergency lights must be used instead. If a vehicle meets the state definition of a tow truck, the driver must adhere to multiple Montana state statutes regarding safety procedures. According to state statute 61-9-411, tow trucks must carry at least three flares with them. If a tow truck does not carry flares, the vehicle must be equipped with three red electric lamps or three portable red reflectors. Each of these objects must be visible within at least 600 feet during normal nighttime conditions. The vehicle also can't use a portable reflector unless that reflector has been specifically designed to reflect at least 24 inches of square space. On top of this, the truck needs to carry at least three fuses that burn red. The one exception is if the driver opts to use special red reflectors or lamps. Every tow truck must have a minimum of two red flags made from cloth, with a minimum of 12 square inches of space. Each flag must come with a supporting standard. If a tow truck poses a significant risk to passing motorists by working in or near the road, these flares must be used as a warning. Powerful lamps and flares are used as an alternative to official emergency lights, as flashing red lights are specific to police cars, ambulances, and firetrucks. 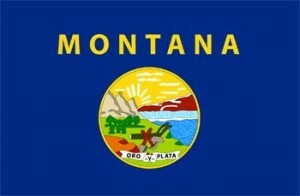 According to Montana statute 61-9-217, motor vehicles are not permitted to have more than two spot lamps. These lamps, otherwise known as brightness settings, must be switched off when the vehicle approaches another vehicle traveling in any direction. Motor vehicles, including construction vehicles, may be equipped with up to two auxiliary lamps. These beams must be mounted at the front of the vehicle, at a height between 16 and 42 inches. If a construction vehicle has a lamp mounted at a greater height than 42 inches, these lamps cannot be used while the vehicle is being used on the highway. Construction vehicles must use their lamps to indicate their presence to passing motorists. However, because the vehicles are not emergency vehicles, these lamps should be a standard yellow or white color. Montana state law does not have any statutes specifically regarding vehicles used by utility companies. If a utility vehicle is being used to make electrical repairs near a road, the emergency light procedure varies depending on the circumstances. When the vehicle is working in good visibility conditions, the driver should follow the same procedures used by construction vehicles. Standard headlights should be turned on to increase visibility. If the vehicle works in low visibility or during the night, they should employ flares and signals to warn passing motorists to move one lane over. The flare requirements are the same as those regarding tow trucks. When a vehicle escorts an oversize load, it must display a sign stating "OVERSIZE LOAD" at a visible height on both the vehicle's front and rear. Each letter must be at least 8 inches tall. In addition, the vehicle needs to display flashing amber lights on either end of the oversize load signs. Each light must have a diameter of at least five inches and an intensity of at least 50 candlepower. It must flash between 60 and 90 times each minute. If the driver doesn't have a flashing light, a strobe light or revolving light can be used as a substitution. The lights must be spaced in such a way that they have 360 degree visibility at night. Security vehicles aren't considered emergency vehicles in the state of Montana. Therefore, they don't have the jurisdiction to light signals of any particular color. Each vehicle should be equipped with standard headlights, and drivers must adhere to basic headlight laws. A driver must not use the bright setting when in the vicinity of another vehicle, but standardized yellow and white colors are permitted.